(Newser) – Chalkboard drawings are made to be erased, but a set of them at an Oklahoma City high school managed to outlive all the teachers and students involved. Workers at Emerson High School removing old chalkboards were amazed to find another set of chalkboards underneath that had not been touched since 1917, the Oklahoman reports. 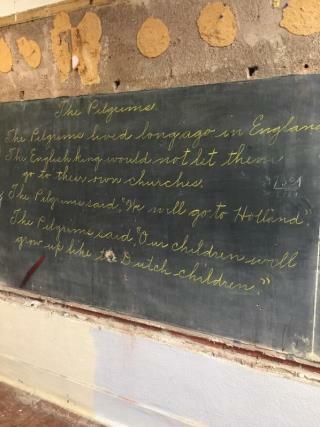 The drawing and writing on the boards appear to date from Thanksgiving of that year, with many of the lessons having Pilgrim themes, reports the Washington Post. "I give my head, my heart, and my life to my God, and one nation, indivisible, with justice for all," reads the pledge written on one board. know people aren't going to like this statement: but who really cares abt old blackboards! 1917 is long "dead and gone!" Also, it's not really that IMPORTANT!!!!!!!! I'm surprised Geraldo wasn't there for the opening. Seeing the cursive on the board reminded me of how handwriting used to be an art. Get a dvd of Bishop Sheen and see him write on the board. Its pretty amazing they could write better standing up at a board than the little darlings can now sitting. My father's handwriting was art and was a joy to just look at. He was just a blue collar grunt. I can't do it, never could. I guess those days are lost forever.